Manage All Your Schedules and Your Operatives with Our Time Planner. For a 14-Day Free Trial, click here! Full Featured Work Scheduling Software Designed to Manage and Streamline Your Entire Business from Start to End. No obligation, no credit card. Book a Demo Have a Question? We can help! 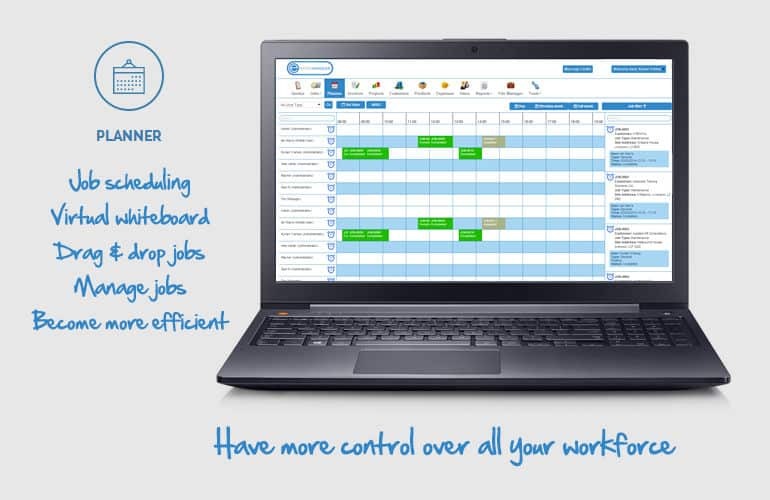 Our Work Scheduling Software offers a virtual whiteboard called the Time Planner. This gives you full control of all your jobs and workers out in the field by using a simple yet effective feature in Eworks. This helps you organise your jobs using a simple drag and drop method. Simply drag one of your unassigned jobs displayed in the planner and drop it into an open slot. Once placed there you can then click and hold the edge of the 'job box' to change the time range of the job and click save so the job gets assigned. This is a great way to allocate jobs as you can see right in front of you, what members of staff are available and work around their diaries. With our Geo Planner you can see a live location of workers out in the field. That way, when a new job comes in your office can quickly see who the closest and next available worker is and assign the job to them. This feature will make sure you are assigning jobs the most efficient and economical way possible. Our Mobile Tracking feature will let you to plan jobs more efficiently. On the map view of the feature, you can see exactly where your workers are at the present time. This means you can assign the closest worker to a new job that comes in. By using the address search field, you can search for a specific address which will show you who the closest worker is. The Eworks Vehicle Tracking feature will let you assign jobs to workers out in the field based on their current and future location. Jobs can be assigned to the closest worker at the time. © Eworks Manager Limited. All Rights Reserved.